We take a fresh approach to catering, utilizing bold flavors and delicious ingredients to bring the most delicious meals to your next meeting, party, fundraiser, or gathering. Our Overflowing Salads, Gourmet Flatbreads, Hearth Baked Pastas, Fire Roasted Wings, Neapolitan Pizzas, and Grilled Paninis will make any event a success. We can even include desserts, bottled waters, gallons of tea, and sodas to complete the package. 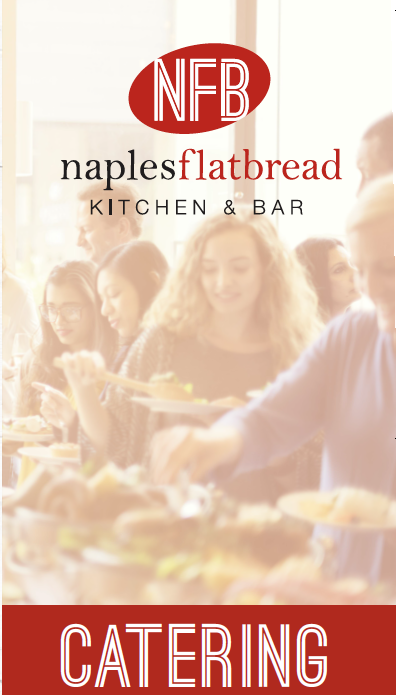 Naples Flatbread was a complete hit. I was feeding a large group and there was PLENTY of food. Thank you!